From sausage, to bacon, to ham, we’ve got all the typical breakfast proteins covered, but with a twist. These simple-to-prepare and deliciousto-devour sides are the perfect accompaniment to any breakfast. 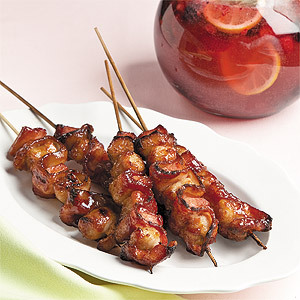 You can use any breakfast meat on these skewers — keep them an assorted variety or stick with just one of your favorites. Preheat oven to 350° line a baking sheet with foil and top with a cooling rack. Coat rack with nonstick spray. Combine barbecue sauce, jelly, and cinnamon in a small saucepan over medium heat until jelly melts and sauce is warm. Thread sausage pieces, bacon strips, and ham pieces loosely onto six 10-inch long skewers. Brush kebabs with sauce and transfer to the prepared baking sheet. Roast kebabs until all meats are browned and cooked through, 45–50 minutes. Baste and turn the skewers every 10 minutes to ensure even cooking. Remove from oven and serve immediately. Coat the skewers with sauce on all sides before roasting, then turn and baste periodically for even cooking.